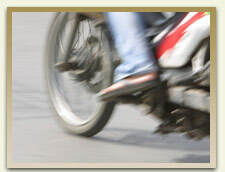 More information from the CDC concerning motorcycle accidents can be found here. Approximately three-fourths of all motorcycle accidents involve collisions with an automobile. Drivers frequently fail to see motorcycles in traffic and this is the leading cause of motorcycle accidents. Intersections are common places for collisions with motorcycles. Interestingly, weather plays a role in less than 2% of in all motorcycle accidents cases. When you are riding a motorcycle, there are some important steps you can take to ensure that you are as safe as possible. Be sure to wear protective clothing that provides injury protection if an accident occurs. Be sure to protect your hands and feet at all times. 1 Ride within your skills. Take time to develop your skills before taking on more difficult roads like highways and interstates. As experienced personal injury attorneys in Jackson, MS, our firm understands motorcycles can provide their owners with tremendous fun and foster camaraderie with other riders. However, a motorcycle owner should always keep in mind that it is more dangerous to drive a motorcycle than an automobile. There are no steel bars or air bags to protect the motorcycle operator in the event of an auto accident. Some motorcycle operators state that they drive both “offensively and defensively.” This means that they always assume the approaching car might fail to detect them and will drive accordingly so as to avoid an accident if possible. In order to be as safe as possible, it is important to pay complete attention to cars around you and anticipate when a mistake may occur. If you or someone you know has been injured or killed in a motorcycle accident in Jackson, Mississippi, please contact the motorcycle accident lawyers at Coxwell & Associates, PLLC today to schedule a consultation. More information on motorcycle licenses and rules in Mississippi can be found here.